Cagebreak! Rats Will Work To Free A Trapped Pal Calling someone a "rat" is no compliment, but a new study shows that rats actually are empathetic and will altruistically lend a helping paw to a cage mate who is stuck in a trap. Calling someone a "rat" is no compliment, but a new study shows that rats actually are empathetic and will altruistically lend a helping paw to a cage mate who is stuck in a trap. Not only will rats frantically work to free their trapped cage mate; they will do so even when there's a tempting little pile of chocolate chips nearby, the study reveals. Instead of leaving their pal in the trap and selfishly gobbling the candy all by themselves, rats will free their cage mate and share the chocolate. "To me that's absolutely stunning," says neurobiologist Peggy Mason of the University of Chicago. "The fact that the rat does that is really amazing." Mason and her colleagues designed a series of experiments, described in the journal Science, to explore the evolutionary roots of empathy. They wanted to look at rats because they already knew, from previous work, that rodents can be emotionally affected by the emotions of their cage mates. For example, during lab procedures, mice seem to experience more pain when they see another mouse in pain. This is called "emotional contagion," and humans have it too — just think of how one crying baby can make other babies cry. "But in the end, emotional contagion doesn't take you very far," says Mason. "It's an internal experience. It doesn't actually do anything for another individual." So Mason and her colleagues devised a test to see if rats would take the next step and actually try to help out a fellow rat in distress. They took two cage mates, who knew each other, and trapped one of them in a narrow Plexiglas tube. That's a mild stressor and one the trapped rat doesn't like — it would sometimes make an alarm call. Over the course of several trials, a rat learns to open a container holding another rat. The free rat outside of this tube seemed to immediately "get" the problem and would work to liberate its pal, says Mason. The free rat would focus its activity on this plastic tube, crawling all over it and biting it, and interact with the trapped rat through little holes in the tube. "And if the trapped rat has a tail poking out, the free rat will actually grab that tail and kind of pull on it," says Mason. Eventually, all this activity would lead to the free rat accidentally triggering a door that opened, releasing the trapped animal. The rats quickly learned to purposefully open the door, and during repeated experiments they would do so faster and faster — but only for a trapped rat. They didn't act this way when the plastic trap was empty or contained a toy rat. 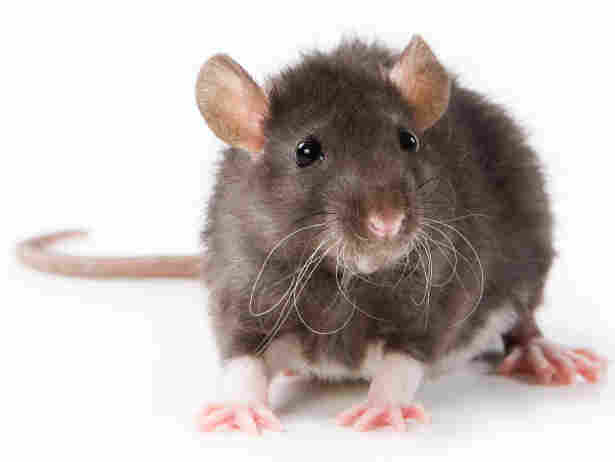 Rats would free their pals even if the experiment was set up so that the other rat was released into a different cage, so that the two rats did not get to interact after the door was opened. This suggests that the door-opener was really trying to aid its fellow rat, and not just working to get a playmate. The researchers had a question for the rats: What is it worth to you, to free your fellow rat? "Obviously we can't ask that question verbally, so we wanted to ask it in terms that a rat can communicate to us," says Mason. So the scientists used chocolate. They put rats into a cage that held two different clear plastic traps. One contained chocolate chips. The other contained the trapped cage mate. Behaviors have to come from somewhere. And so it would be almost absurd to expect not to see some sort of simpler form of human sociabilities in other animals. What they found is that the free rats quickly opened both cages, in no particular order. And they did not eat all the chocolate — instead, they shared it with their fellow rat. While the rats clearly engage in pro-social helping behavior, Mason says it's impossible to know the rats' internal experience of all this. "I think it's extremely unlikely that the rat has the same conscious experience that we do," says Mason. Still, this study shows that the roots of empathy extend all the way back to rodents and aren't something that's unique to primates, she says. A minority of rats never opened the trap's door, says Mason. They tended to freeze, suggesting that they felt their partner's distress but could not shake it off and calm down enough to take action. Jeffrey Mogil of McGill University in Montreal, who has studied empathetic behavior in mice, says this is a surprising study. "You know, it's one thing to free the trapped rat that might be making alarm calls. It's quite another thing to share the chocolate chips," Mogil says. Previous work in Mogil's lab has shown that when mice are given a temporary stomach pain, their female cage mates will go spend more time near them. And the more time their cage mates spend with them, the less pain behavior the mice will show — suggesting that the extra companionship is in response to the pain and that it actually helps in alleviating it. Mogil says the new experiment on cage-opening rats is "a lot more robust, a lot less subtle" than that earlier mouse study. "What's impressive about the current study is that it's an active response," says Mogil. "We can argue about why they're doing it, but there's absolutely no doubt in my mind that they're doing something that can really only be called pro-social behavior." What's more, he says, the experimental setup in this study is so simple that he expects lots of labs, including his own, to repeat the rat study and start expanding on it. He says it could be used to explore the neurobiology of helping behavior and allow scientists to find genes that are involved in empathy. He also wonders if rats would be as quick to help strange rats that weren't known to them, as opposed to their familiar cage mates. Even though, in the past, many scientists have assumed that altruistic behavior is something uniquely human, Mogil says we really should not be so surprised to see it in the lowly rat. "Behaviors have to come from somewhere," he notes. "And so it would be almost absurd to expect not to see some sort of simpler form of human sociabilities in other animals."